Apparently bashing the NFL is racist. 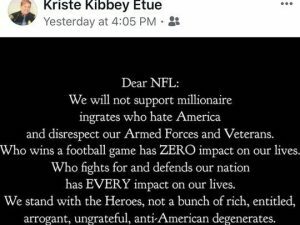 The Detroit Branch of the NAACP and civil rights attorneys on Tuesday renewed their criticism of Michigan State Police Col. Kriste Kibbey Etue after she shared a Facebook meme critical of pro football players who kneel during the National Anthem. She removed the post and apologized afterwards. The Rev. Wendell Anthony, president of the local NAACP branch, said during a press conference at the group’s headquarters that Etue is symbolic of a culture of racism within Michigan State Police.